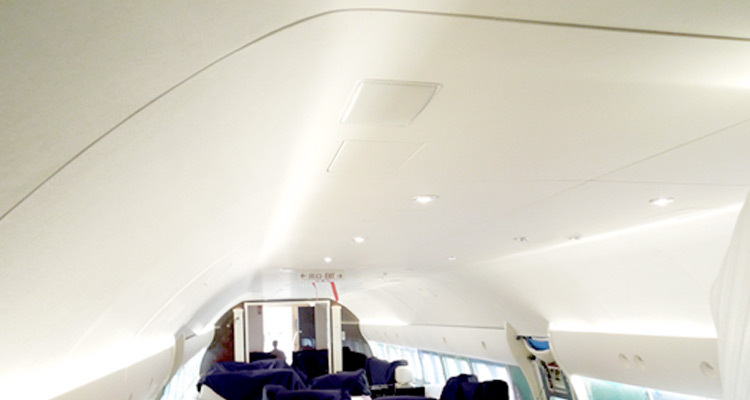 From King Airs to Boeing 747s, our headliner kits include valence panels, ceiling panels, domes, rotundas, and all secondary supporting structures. 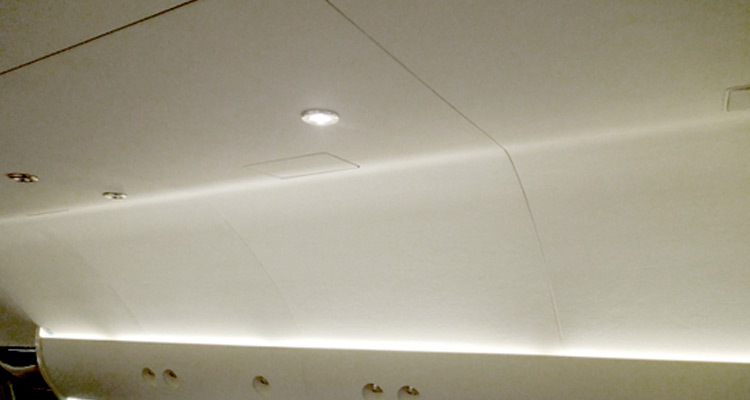 In addition to full burn test certification, we can also provide cutouts and foam inserts for lights, speakers, and other ceiling components to eliminate time consuming edge-fill in all the cutouts. JBRND Headliner Kits are professionally manufactured for any size aircraft with any number of configurations. All pieces are made at our facilities in San Antonio, Texas and packed ready for installation in the aircraft. Our valance and ceiling panels are cut to fit. 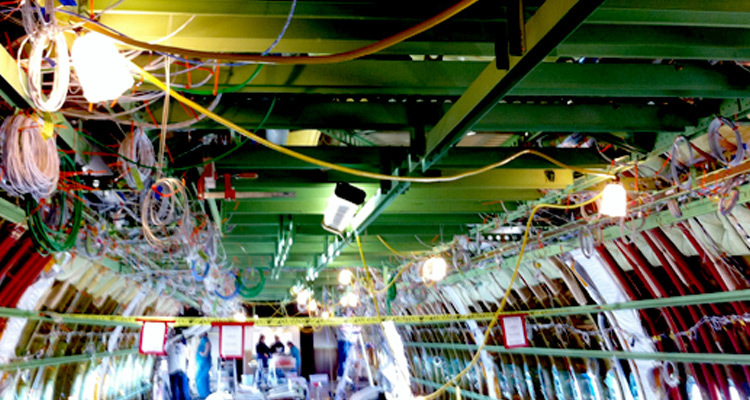 JBRND engineers do the painstaking math to ensure each panel fits exactly as it should in the aircraft. Aircraft Headliners are a very complex and delicate section of the aircraft. For today’s VIP, commercial and military aircraft, a headliner has to be exceptionally lightweight and well built. As we embrace some of the newer and more efficient technologies for aircraft manufacturing, JBRND headliners have evolved beyond what can be found in many VIP interior companies. When choosing JBRND LED cabin lighting or JBRND IR Sensors for the aircraft, all mounting brackets come pre-assembled on all headliner panels for easy install. JBRND constructs headliner panels from the lightest composite materials available. JBRND has completed a number of headliner kits ranging from a Boeing 747-8 to a Hawker 400. JBRND has also completed 6565 rated aircraft headliner kits with full burn test certification. In addition to full burn test certification, JBRND does long beam/short beam testing for every single kit. JBRND aircraft headliners also include custom foam inserts for strengthening ceiling cut out holes for speakers, sensors, lighting, etc. Each JBRND Headliner Kit is manufactured to the customer’s specifications. We can accommodate all types of special circumstances. Keep in mind that JBRND also manufactures LED lighting systems and other components related to the headliner. JBRND will be happy to provide quotes for any other components, making the production process much more convenient for everyone. 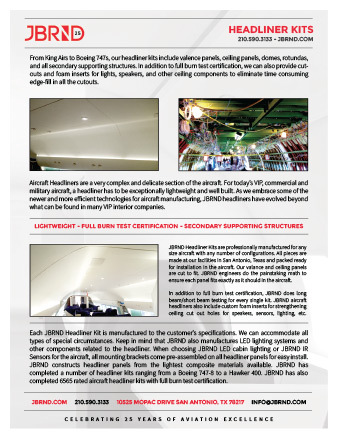 Get the JBRND brochure for our headliner products. The brochure is one page, in PDF format, ready for printing. If you are interested in any other JBRND brochures, make sure to visit our Downloads Section, where there are many others available. As always, just get in touch if you have questions. JBRND has completed many headliner kits for all size aircraft. We'll be happy to get you a quote for your headliner kit and more. Get in touch with JBRND today to see what we can do for your project.